Khandesh is in the north-west corner of the Deccan Plateau. When you come from North India, this region signals transition to Deccan. Cutting through Khandesh is the Tapi River. To the north lay the hills of Satpura. Most rivers in the Deccan flow east. The Tapi flows west. According to Wikipedia, the Tapi flows in a deep bed and therefore historically its waters were difficult to use for irrigation. The lands north of Tapi are fertile but most of Khandesh lay south of the river. Bhupendrasing Rajput was born 1969, in the Khandesh region; in Mandane village, part of Maharashtra’s Dhule district. “ In modern times, Khandesh is where the borders of Maharashtra, Madhya Pradesh and Gujarat meet,’’ he said. We were at a park in Hauz Khas, New Delhi. It was early April, 2017 – Mumbai had been hot when I left it; Delhi felt comparatively pleasant. The previous night it even rained. What’s happening to weather? – I thought. Overall, the paradigm of life in Mandane was tough in more ways than one. The terrain is undulating. There is a small river near the village. “ The river has been dry since my childhood. When I was six or seven years old, I remember water being available in the village. After that, it has been generally dry,’’ Bhupendra said, illustrating the frugality within which, life and farming in these parts must operate. He was the fourth child among five brothers and two sisters. His father, a farmer, was also Gram Sevak; the executive officer of a Gram Panchayat. Mother was housewife. “ I too am a skilled farmer,’’ Bhupendra said. In fact, till fifth standard at school, he had attended to regular responsibilities in farming. Bhupendra studied up to fourth standard in Mandane. According to him, the village is still stuck at that level of local education. Even today it offers no scope for further study. Same has been the case with regard to transport connectivity. There was no bus to Mandane in Bhupendra’s childhood. There still isn’t; the road is a kilometer away. For his fifth standard, the boy attended school at Dondaiche, a town four to five kilometers away from home. From sixth to twelfth standard, he studied at Dhule. Not just Bhupendra, his siblings also shifted to Dhule. There, they rented a two room-house for stay and onward studies. The parents stayed back in Mandane. This meant, from a young age itself, the children tended to all details of survival, from cooking to washing and studying. The arrangement wasn’t easy on the pocket. The year before the children shifted to Dhule, the family’s house in Mandane was burgled. The loss was significant. “ It left us financially weak. We were struggling and struggling,’’ he said. Amid this, the shift to Dhule and pursuit of studies had a reason. Bhupendra was a good student right from junior school. Till the tenth standard there was no concept of scholarship. His teachers took note of the family’s struggle and often waived fees. By the time he was in the ninth standard, Bhupendra was earning on the side to support his studies and the siblings’ stay in Dhule. His job was making copies of audit reports. “ Typewriting was a luxury. My job was to make three to four handwritten copies of these reports. I was paid one rupee per page,’’ he said. This work of making copies usually commenced around 9-10 PM. Next morning on his way to school, he would submit the work to his employers. In tenth standard, Bhupendra topped his school, meriting scholarship support for eleventh and twelfth standards. After twelfth, he found himself at the crossroad most students pass through in India – medicine or engineering? He gave up medicine as it was expensive. He was admitted to do his engineering at the college of engineering in Pune but traded that for a more affordable course in agricultural engineering at the Agriculture University in Rahuri near Shirdi. To help him through this phase, he had merit scholarships won in his twelfth standard, plus, he took tuitions. He also availed an education loan from Punjab National Bank (PNB). Bhupendra topped the university in his engineering course. “ My desire was to pursue post-graduate studies in the US. I had decent scores in GRE and TOEFL. I also got admission at the University of Illinois with 100 per cent scholarship. But for some reason, I was declined visa. I was rejected in all my three attempts. I had to reconcile myself to that rejection,’’ he said. In September 1991, he joined Thermax Ltd in Pune, working for them in Pune and Mumbai. Through all this, sports had no significant presence in Bhupendra’s life. Back in Mandane, he used to play kabaddi. In middle school, he recalls doing the high jump. “ Probably, I needed to burn some calories; that’s all,’’ he said. What he does admit to doing consistently is – long walks. “ Long walks barefoot were a part of my life. Besides, I am also the kind of person, who once he gets the hang of something, goes on with it,’’ he said. Awareness of marathon set in much later, when he was posted to Mumbai on work with Thermax and one day, saw a city bus with the advertisement for the 2006 Standard Chartered Mumbai Marathon (SCMM) on it. “ The enrolment process then was to go to the office of Standard Chartered, fill in the form and drop it off with a hundred rupee note attached,’’ he said. Bhupendra registered for the half marathon. On race day, with no idea of what the marathon entailed and lacking the basic essentials to turn up properly attired for it, he ran the event in “ office pant, office shirt and office shoes.’’ He finished the race in two and a half hours. “ I just went with the crowd, I was borne along by it,’’ he said. 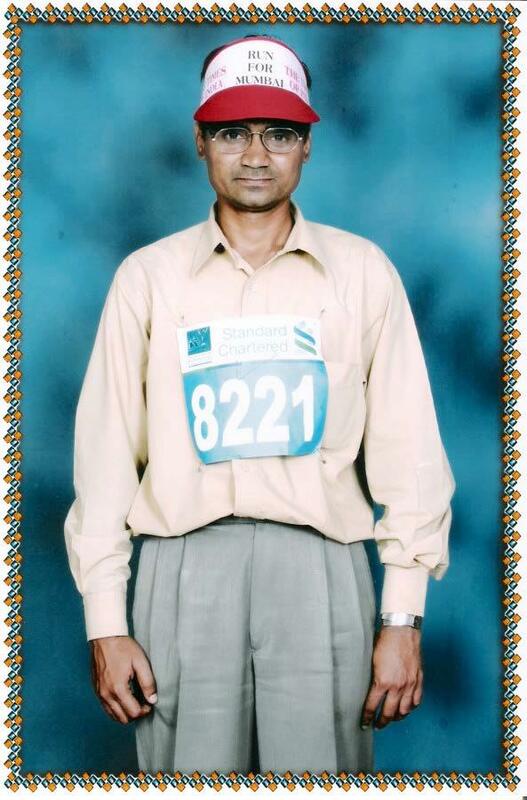 After completing the run, he went to a photo studio in Chembur and had a picture taken for posterity. Post SCMM, one change happened. He started running two to five kilometers every day. 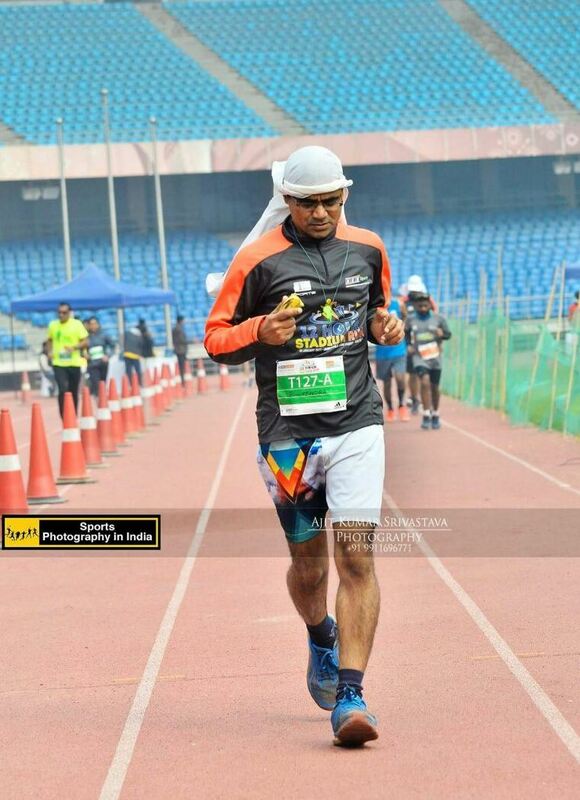 “ The idea was to stabilize my performance in the half marathon,’’ Bhupendra said. He ran the SCMM half marathon again in 2007 and 2008, eventually managing a non-stop run with finish in just above two hours. At that point, he decided to graduate to the full marathon. From what he said, one aspect of Bhupendra’s progression in running strikes you. He was in Mumbai, very clearly at that time the running capital of India. Places like Marine Drive in the city have hosted runners for years. SCMM was nudging through a running culture. Yet Bhupendra was bereft of any company in running. He was staying in Andheri those days and used to train at Joggers Park in Lokhandwala Complex, running daily “ with much energy.’’ “ My problem was that I had nothing to talk of with anyone, except running. I don’t smoke, I don’t drink. The world around had no incentive to invite me for any socializing,’’ he said. Result – Bhupendra then and to date is not part of any running group. He negotiates running’s maze by himself. 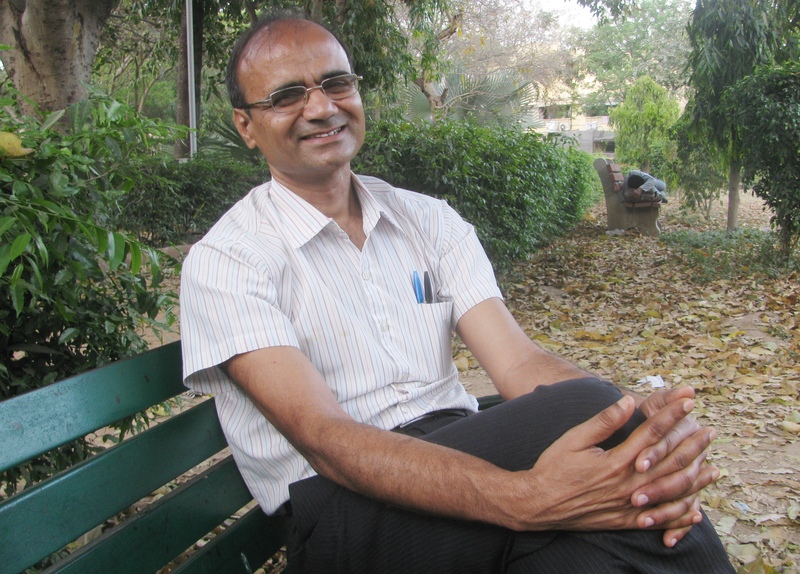 In 2008 Bhupendra moved back to Pune from Mumbai. But the full marathon plan stayed on course. With no significant change to his training schedule and logging the same modest mileages he used to put in daily, he went ahead and ran the full marathon of the 2009 SCMM. “ I completed the run in 4:46 or so. I never felt there was anything difficult about it. Of course, there was the occasional struggle in that run-walk, run-walk…but I always knew I would do it,’’ he said. A breeze rustled the dry leaves on the ground. Not far from the park bench we were seated on, a group of boys began playing football; the conversation at the bench periodically punctuated by the dull thud of ball landing close by. If the 2006 SCMM triggered the practice of running daily in Bhupendra, the 2009 SCMM did more. He ran a plethora of races thereafter, among them – Kaveri Trail Marathon, Airtel Delhi Half Marathon, Baroda Half Marathon and TCS 10K. “ After the 2009 SCMM, it was a mania,’’ he said laughing. He didn’t distinguish between distances too – he welcomed 42 km; 21 km, 10 km alike. Post 2010, somebody introduced him to Facebook and through it he got introduced in turn to the world of trekking. “ I am now a crazy lover of the hills,’’ he said. Facebook was also avenue to something else. 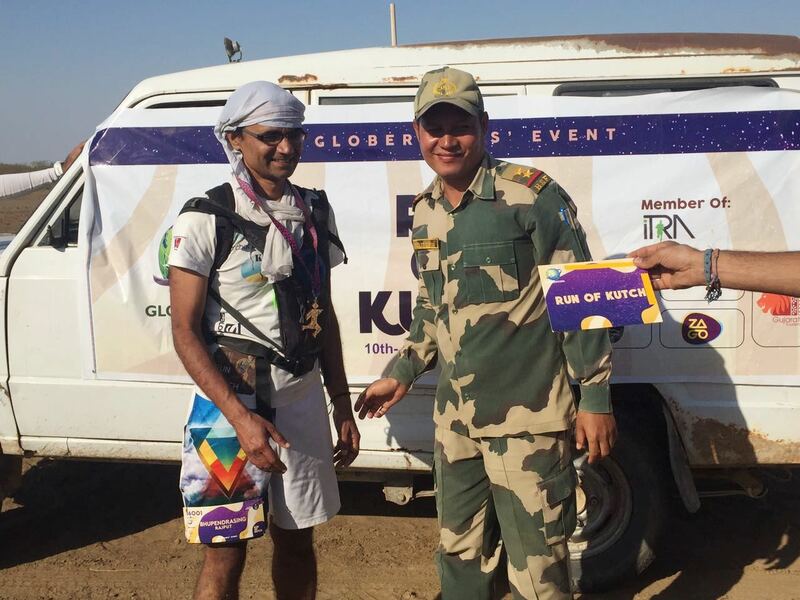 Vishwas Bhamburkar, a runner from Ahmedabad, posted on Facebook that he was interested in attempting the 135 mile-Brazil Ultra and wished to do a training run of 150 km around Pune. “ I was curious,’’ Bhupendra said. In September 2011 he joined Vishwas for the training run, starting one night at around 8-8.30 PM and going on till next evening. Well known ultra-runner Aparna Choudhary was the third person participating. By next evening, Bhupendra had logged 135 km without any problem. “ I observed that only some 40-50 km was real running. The rest was walking. I asked how this can be and Vishwas responded: that is how ultras are managed. It occurred to me, if this is the case, then ultramarathons are doable,’’ Bhupendra said. 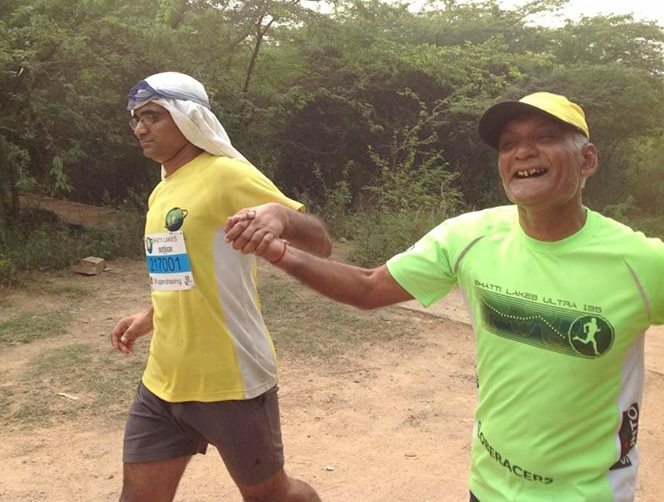 Following this training run, Bhupendra and Vishwas met again in Hyderabad for the Hyderabad Heritage Marathon of October 2011. 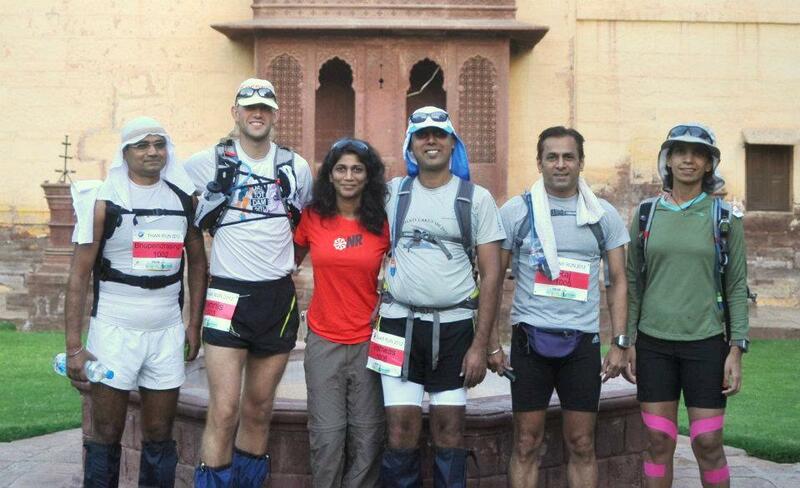 Vishwas suggested that Bhupendra attempt an upcoming ultramarathon – the Bhatti Lakes Ultra organized by Globeracers. “ Once again it was a case of no training, somebody pushing and I being there,’’ he said. The race was an eye opener. 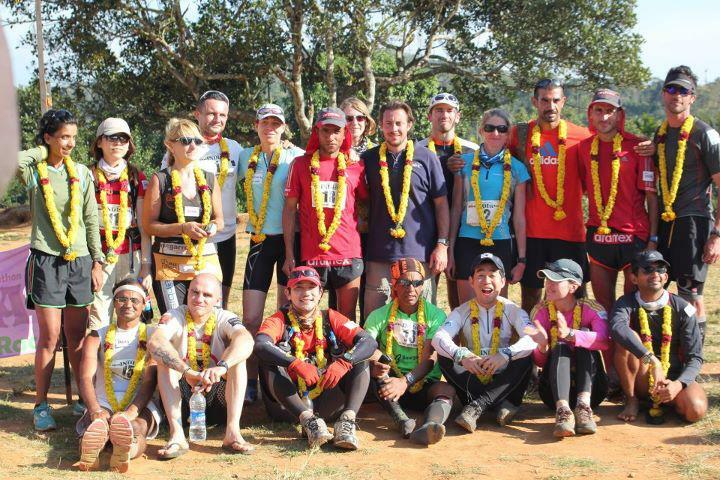 “ The Bhatti Lakes Ultra was a fantastic experience. Besides Vishwas and Aparna, among those I met were Aditya Bee, Gaurav Madan, Milind Soman and Raj Vadgama. It was a clean completion for me. 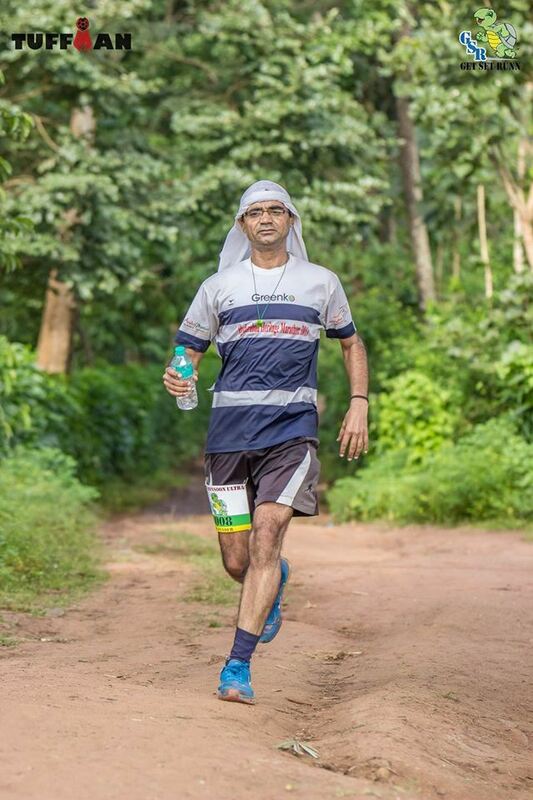 I topped the 100 mile-category, finishing it in 27 hours, 28 minutes,’’ Bhupendra said. If Facebook introduced him to Vishwas and ultra-running, Globeracers offered him a basket of ultramarathons to attempt. 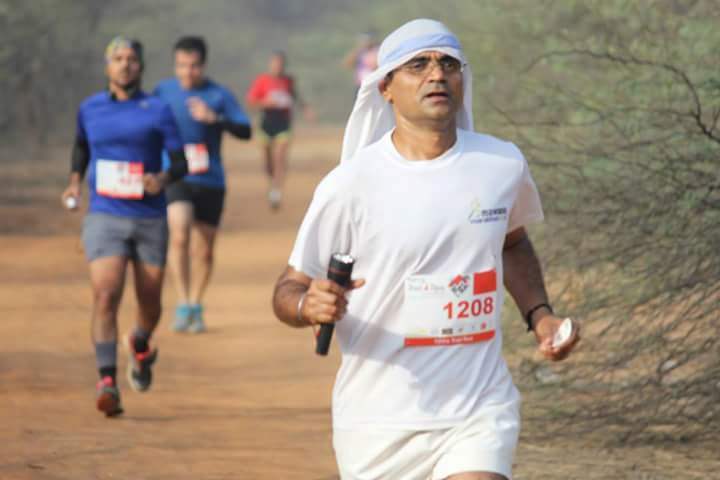 “ Globeracers has really created good benchmarks in organizing ultramarathons not only in terms of mileage but also in terms of trails and locations,’’ Bhupendra said. He went on to run Globeracers’ 100 mile-ultramarathon in Thar Desert once, the 100 km-ultramarathon in Nilgiri once, the 100 mile-ultramarathon in Kutch four times, the 135 mile-ultramarathon in Uttarkashi four times, the 100 mile-category of Bhatti Lakes once and its 135 mile-category four times. Typically, runners are conservative at picking their events. They give their bodies time to recover from each race and hence space out the races. Bhupendra’s calendar would seem anything but that. Compounding the apparent madness would be the fact that he is regularly logging ultramarathon distances (although in training he was still sticking to modestly long runs). Needless to say, his share of Did Not Finish (DNF) piled up. The 2014 and 2015 Bhatti Lakes were cases of DNF as was Kutch in 2016 and Uttarkashi in 2012. According to Bhupendra, Kavitha Kanaparthi, who runs Globeracers, advised that he pause and introspect: maybe he needed time to recover? It is hard to deduce what makes Bhupendra run so. A window to his mind is available in what keeps him going in the ultramarathons he participates in. “ My sense of home is moving away from civilization. By civilization I mean, the urban cluster, the concrete jungle. As you move away from civilization resources become scarce – that is when you have a challenge to manage things,’’ he said. The nature of engagement herein can be further understood if you examine two points. First, among ultramarathons, Bhupendra says he prefers those that court trail or wild settings. The more the element of nature, the more he likes it. Second, as the afore said management of scarce resources kicks in, he is metaphorically in a return to childhood, when he and family had little to live on and they required to stretch resources as best as they could. Yet again, this may explain, in an oblique way, why he runs the way he does. It isn’t conclusive. What’s truly bizarre is that, according to him, his training regimen remains very modest even today. His daily mileage is still two to five kilometers, he claimed. For Bhupendra what matters most is – mind. “ I decide on running with my mind. Once the mind has decided on a run, I can carry on. I don’t give up unless things are totally beyond my control,’’ he said. So what was the factor getting out of control and forcing those DNFs? The Kutch DNF happened in February 2016. 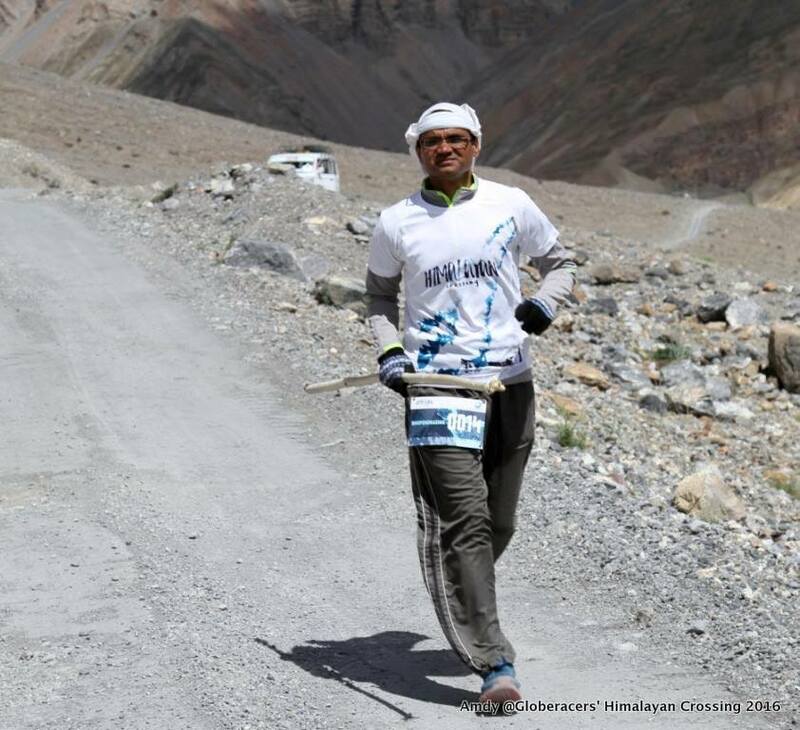 Soon thereafter, Bhupendra opted to do the 2016 Himalayan Crossing organized by Globeracers; it was due in July. He was originally scheduled to be crew member for a runner from New Zealand and the way it was structured, the race was to be – perhaps for the first time in its history – a 338 km-single stage run in the Spiti Valley with maximum elevation en route touching 15,060ft. A month before the event, the New Zealand runner opted out. Bhupendra stepped in as runner. “ When he applied for Himalayan Crossing, I wasn’t sure if he was ready but being aware of his ability to stop if he feels that’s the right thing to do and not push on in the face of physical adversity, I accepted his application. I am usually tuned in to most runners’ psyche; that is, those who run with us regularly. I have turned them down too for some races. Accepting Bhupendra’s application was a decision based on his prior experience at races and his approach to them,’’ Kavitha said. Bhupendra was the sole runner that year and it is to Kavitha’s credit that she kept the event going despite such low enrolment. The route starting at Tabo and going over the Kunzum La (15,060ft) and Rohtang La (13,050ft) to Manali also included a couple of detours that were more like treks. Bhupendra completed it in approximately 78 hours. Not just that, in August (the Himalayan Crossing was in July) he successfully completed the 135 miler in Uttarkashi, in September he ran an 80 km-ultramarathon in Coorg, in October he completed the 135 miler at Bhatti Lakes, in November he ran the Airtel Delhi Half Marathon barefoot to a personal best of 1:40, in December he did the Bengaluru Midnight Full Marathon and 50km Summit 2, in January 2017 he ran a 12 hour-stadium run in Delhi and a 12 hour-trail run in the Aravalli and in February 2017 he completed yet again the 100 mile-ultramarathon in Kutch along with the New Delhi Full Marathon, which he ran to a personal best of 4:07. “ I did this focused on just one thing – let me prove that body recovery is not something utterly mandatory. The body knows how to deal with itself. I am not for a minute saying that you should ignore your body and run everywhere. I am only saying, body recovery is not something you should be bogged down with,’’ Bhupendra said. However he did make one major change at the ultramarathons he ran after the 2016 DNF in Kutch. 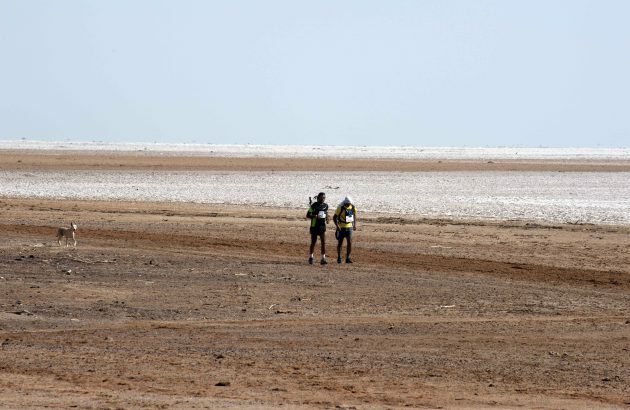 He consciously decided to take adequate fluids and food while running; as further precaution he told event organizers to make sure that he ate and drank for deep into an ultramarathon, he may have drifted off into a zone forgetting what his body needs. “ Bhupendra is one runner who doesn’t believe in doubting himself as long as he has trained and his body is not ailing. It does not work for everyone, especially when they are not as mentally strong as Bhupendra. What works for him is his level of maturity and perseverance,’’ Kavitha said. If, as he says, the bulk of his running lay in the mind, then perhaps Bhupendra digs meditation? Wrong; he doesn’t do any meditation. What he does is – he does all the work at his house in Saket, by himself. A bachelor, he stays alone. He cleans, cooks, washes, takes care of all household chores. He employs none to help. “ I do this by choice. It is not by compulsion. Doing your own work at home is the best meditation anyone can have,’’ he said. Bhupendra’s father passed away in 2000. He had promised his father that he would make sure his sisters are settled well in life. One sister is married; the other hadn’t yet. In August 2014, Bhupendra joined Driplex Water Engineering Private Limited and shifted to Delhi. The mix of tough childhood and an adulthood with plenty therein to remind him of what he had endured to reach where he did, has spawned an unorthodox outlook in Bhupendra towards what races he may do in future. Events cost money. He has no sponsors; he does not want sponsors either. He also does not want to throw a truckload of resources into running, for running is his passion and he sees no reason to spend indiscriminately on a passion. “ A lot of my walking in childhood was barefoot. I don’t promote barefoot running but beyond need for a pair of functional running shoes I don’t chase big brands. I will run, no matter what shoes I wear,’’ he said outlining his position in the realm of brands and sponsors. What can brands do with a man who sees through the gloss of marketing and says he will run anyway? He nurtured fancy for one costly event overseas – TransOmania. Otherwise, he appeared content racing within India. “ If I find it enjoyable, economical and feel ready for it, I will run overseas. But just because others have done it and therefore you should – no, I can live without that,’’ he said.